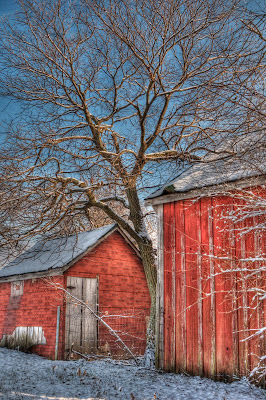 Tuesday was a beautiful unexpected snow event and I was on the road in Frederick county, Maryland when after a morning of snow the clouds broke in the afternoon. 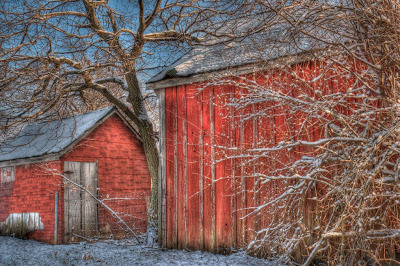 Heading up a country road the orchard laden with snow begged me to pause and create some images. I wanted to use Photomatix to process these images so I was bracketing in the field. The straight orchard shots were actually a little disappointing. 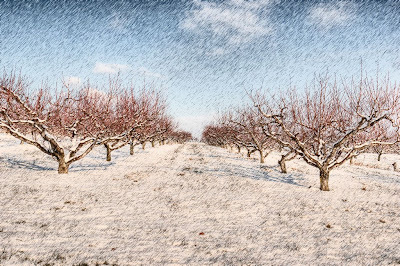 I envisioned them in an artistic way as opposed to a straight shot when I was shooting and I did not like the orchard as an HDR shot, so I played with some artistic options in Photoshop and I like the ink pen rendering.